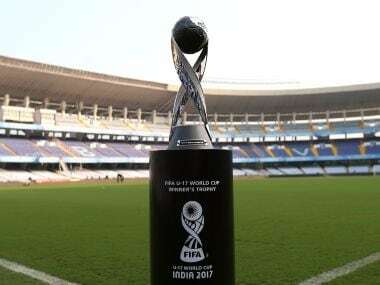 It will be a case of ‘familiar foes’ when England take on Spain at Vivekananda Yuba Bharati Krirangan on Saturday in the finals of the 2017 FIFA U-17 World Cup. Spain will be hoping to repeat their feat of breaking English hearts in a youth tournament finale once again after their win on penalties in the U-17 European Championships earlier this year. A high-octane contest which promises goals galore, the World Cup final will see two of the finest young centre-forwards — Abel Ruiz and Rhian Brewster take the field. While the latter has found the net on one extra occasion, it is Spain’s Ruiz who holds the torch between the two. Spain’s most experienced U-17 player and the highest goalscorer at this level, Ruiz spearheads the side's attacking quartet — involving Sergio Gomez, Cesar Gelabert and Ferran Torres aside from himself — which has produced the goods in each of Spain’s knockout games. Even when Ruiz is not on the scoresheet, he is the pivotal figure whose influence stands out in every match. Ruiz’s unique pedigree, for he operates not simply as a poacher of goals, but as the fulcrum of Spain’s passing game makes him the most dangerous player in 'La Rojita'. His proficiency and composure in front of the goal is well-documented. There is hardly any doubt that the Spaniard, with his extensive experience at club and international level, has what it takes to carry the entirety of Spanish hopes on his shoulder. A trequartista in the truest sense, Gomez combines technical ability with directness — Spain’s No 10 operates in the pockets of space between the opposition’s defence and midfield, while floating seamlessly across the midfield channels — his splendid reading of the game and sublime passing range guiding him to dictate the rhythm of the play. Gomez, who has started every game for Spain this autumn, is not merely a creator of goals, his presence allowing Spain to influence their assertiveness while going forward, distinguishing Spain as a side that produces moments of absolute finesse from a team that goes about incessantly circulating the ball. While he did not produce a goal or assist during Spain’s Round of 16 victory over France, it was Gomez’s second-half showing which spurred the European champions’ resurgence in Guwahati. Mateu Jaume Morey, the sprightly Barcelona right-back who was a subject of interest of Bavarian giants Bayern Munich earlier this year, has been putting in diligent shifts in a Spanish defence which has consistently leaked goals and looked shaky when subjected to sustained periods of pressure. On Saturday, Morey must contend with Callum Hudson-Odoi’s pace and link-up play with Brewster to cut off England’s usual channels of attack. 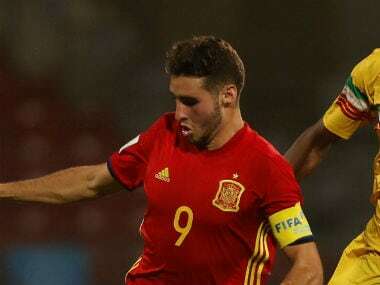 Morey’s overlapping runs on the right flank add another dimension to Spain’s game and his understanding with Torres will be significant for Denia’s side to outfox the otherwise excellent Young Lion Jonathan Panzo. The 'Los Blancos' central midfielder, a core component of the Spanish contingent which impressed in Croatia, has been one of Spain’s understated players during his time in India. In a squad brimming with creative flair, Blanco’s presence adds steel to the midfield. Blanco will be crucial to Spain’s plans of stopping England’s dynamic young central midfielder George McEachran from linking up with the dangerous Phil Foden. While the evenly-matched contest between two of Europe’s best squads will be decided on the number of chances either team creates, Blanco will be essential for Spain to control the tempo of the game as they did against Iran and Mali. The fact that Spain have struggled to maintain an effective defensive shield whenever Blanco has been subpar (as against France in the first-half) or absent (when he was substituted against Iran) underlines his role in Spain’s gameplan. “One of the things I look in my midfielders is their ability to contribute with goals,” Denia had said after Torres grabbed his second goal of the competition during Spain’s quarter-final win over Iran. While the 17-year-old Valencia academy product is renowned for his pace on the wings, it is his overall gameplay which makes him such an invaluable member of this Spain set-up. An excellent passer of the ball, it is Torres’ vision which surpasses his close control and makes him the ideal candidate for the game changer Spain can look up to. He not only creates strong chances by cutting inside from a wide position, but also manages to find teammates with clever passes while drawing defenders to himself — as showcased during his assist for Gomez’s stunner against Iran. Having already drawn comparisons to Real Madrid’s Marco Asensio because of his composure in the eighteen-yard box and all-round ability to turn games on their head, England should be wary of Torres and his guile. The settled nature of Spain’s starting lineup, with Denia opting for the same eleven players in every game since their 2-1 loss to Brazil in the opening fixture, allows the European Champions a semblance of assurance for each of the eleven individuals. Backed by a strong bench, the players have honed their skills and are acclimatised to playing together in the Indian conditions, providing Spain the cutting edge needed to win the World Cup final.